‘Twas the night before the holiday break, and all through the house, not a creature was stirring, except for the weirdo scaling the wall, crawling into the attic, murdering a sorority sister, and taking the body back up into the attic to rock in a rocking chair. Yeah, aside from that, everything is fine. Bob Clark’s classic 1974 slasher, Black Christmas, follows a sorority house preparing for the upcoming holiday season. Jess (Olivia Hussey) has recently learned that she is pregnant with her boyfriend’s child. Her boyfriend, Peter (Keir Dullea), is clearly upset over her decision to have an abortion. But her shady and possibly unstable boyfriend is only the beginning of her problems. One of the sorority sisters has gone missing, and the girls are continually receiving strange phone calls from someone with an eerie voice. And guess from where the calls are originating? 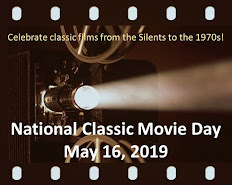 Canadian filmmaker Clark, who also helmed the popular teen comedy, Porky’s (1982), and the yuletide favorite, A Christmas Story (1983), directs a film with style and wickedly dark humor. He keeps the murderous stranger hidden throughout most of the film, and it’s even difficult to decipher the character’s gender, especially when the voice on the phone is so vague (on at least one occasion sounding almost like two people). As the phone calls continue, the caller becomes increasingly more agitated and threatening. Clark heightens the terror by simply having the phone ring. The director's bits of comic relief -- including a goofy cop working the front desk at the police station -- are welcome within an otherwise intense movie. 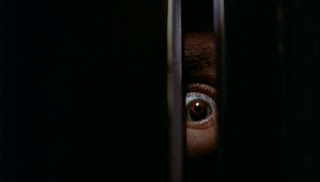 One way in which Clark retains suspense is presenting the killer’s point-of-view (POV). In French filmmaker Françoise Truffaut's book on Alfred Hitchcock, the British auteur essentially defined "suspense" by contrasting it with "surprise." His example was a bomb suddenly exploding (surprise) vs. the audience fully aware of a ticking bomb during an entire scene before the explosion (suspense). 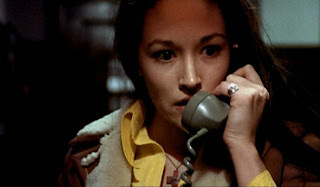 In Black Christmas, Clark uses Hitch's approach to suspense, by showing the audience the killer entering the sorority house almost as soon as the film begins. Throughout the movie, the viewers are repeatedly provided with the killer's POV. Not only does the audience now see the irony in the sisters locking the doors for safety, but it has an exceptionally good reason to be frightened. Clark even takes the killer's POV one step further. He doesn't just visualize the killer's perspective, but literally has the camera become the eyes of the killer. The audience can even see the killer's hands while ascending toward the attic and pushing open the window. The majority of the stranger's transgressions are presented in this manner. This almost forces the audience to identify with the killer, but also makes viewers feel helpless, having no control over the actions. Four years after Black Christmas, John Carpenter incorporated a similar technique in Halloween, making it immensely popular in horror films. Hussey is sensational in the lead role with a strong, mature performance, and Dullea is appropriately disturbing as Peter. Margot Kidder (pre-Lois Lane) is surprisingly charming as the rather obnoxious, bad-mouthed Barb, and Andrea Martin (who would become a member of the Canadian sketch comedy show, SCTV, two years later) is equally good as one of the sorority sisters, Phyl. John Saxon rounds out the cast as a local detective. Edmond O’Brien, who starred in a number of films, including D.O.A. (1950) and The Man Who Shot Liberty Valance (1962), was originally cast in the role that Saxon eventually played but had to drop out due to deteriorating health. He died the same year. Black Christmas also played in theatres under the title, Silent Night, Evil Night, and was broadcast on television as Stranger in the House. Glen Morgan and James Wong of The X-Files fame directed a remake in 2006. Interestingly, their version provided a back story for the killer in the attic. Clark’s characterization of the mysterious slasher (and ultimately his film) proved much creepier and more memorable, but Morgan and Wong still managed to churn out some frights with an enjoyable flick. 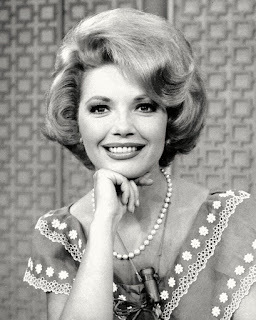 Original cast member Martin appeared in the remake as the housemother. Great blog on Black Christmas. I remember this movie and it's a good one. Much better than the remake but isn't that always the case. Speaking of Margot Kidder who is terrific in this film...did you see her in this other 70's horror flick called Sisters? She played twins, one of whom is a killer. It's funny most people remember Kidder as Lois Lane from the Superman movies, but she was equally adept in some creepy horror movies back in the day. Just sharing some information. Great post though on BC. Sark, I think that’s your best opening line yet! I saw BLACK CHRISTMAS with my sister it was released theatrically as SILENT NIGHT, EVIL NIGHT. I remembered it as a pretty good suspense film. But when I watched BLACK CHRISTMAS again earlier this year, I realized that it pretty much created the American slasher movie genre as it’s known today—well before HALLOWEEN and FRIDAY THE 13th. The DVD had a great documentary, too, and explained that John Saxon filmed all his scenes by himself—even though they were edited to make it look Saxon was interacting with the rest of the cast. Excellent review (particularly the distinction between surprise and suspense and how they’re used in the film). Thanks for the great comments, guys! Monty, I have indeed seen SISTERS, which is a great film with a wonderful performance from Margot Kidder. I did a write-up on that film earlier this month if you want to check it out. Sark, this is a fantastic review of BLACK CHRISTMAS. This is one of my favorite scary films. This version is superior to the remake which I have seen. I have watched this many times. The ending is unique and disturbing. I am a fan of Keir Dullea. He is excellent in this movie although I think he is awesome in BUNNY LAKE IS MISSING. Margot has the best line in the fim when she is talking to a dumb cop about the phone calls and gives the sorority house's phone number. Saxon is a good actor too. His best movie is ENTER THE DRAGON. Great review and I enjoyed reading it!! Sark, This sounds like one scary flick. A very different interpretation of Clement Clarke Moore's poem for a dissimilar Clark. That sure got my attention, Sark! Extraordinary blog, once again. I was just thinking of how "A Christmas Story" is poles apart from this work. And remembering Ralph in a bunny suit lets me transition out gracefully. Thanks Sark for the heads up on your post of Sisters. I will check it out.